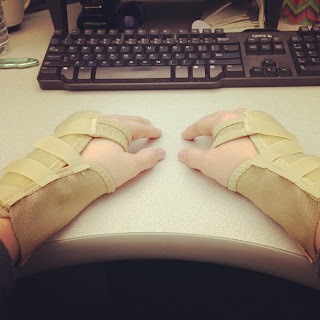 I tested positive for Carpal Tunnel, so wrist guards all day for that. I may or may not have some sort of foot CTS (I forget the name), which there's really no treatment for. Could also be low blood sugar or a B12 deficiency. So I was sent for blood work too. For now, the guards, and ergonomic changes at work, and more supportive shoes. Will know by Friday if anything abnormal in the blood. If this stuff doesn't help and blood work is normal, it's off to a neurologist. Which, she warned me, is not very pleasant because they'll test my nerves involving some sort of electric current thing through my arms. I'm hoping no neurologist. One step at a time. These things are a pain. 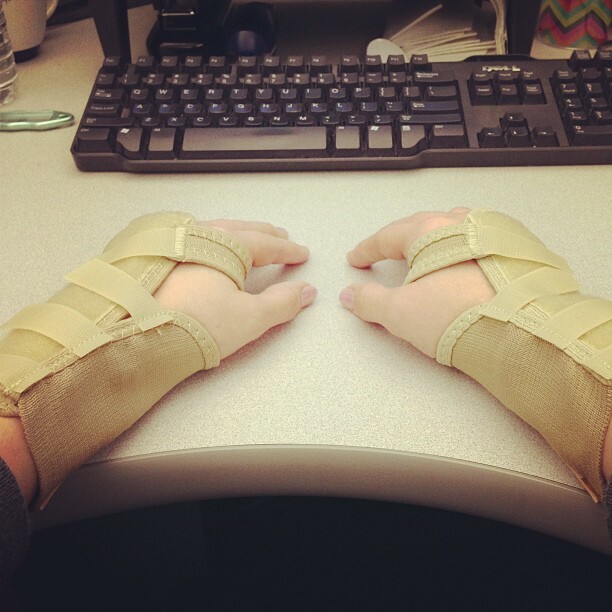 It's harder to type and they're not all that comfortable but I suppose I'll get used to them. I'm super proud of myself that not only did I not cry for the blood test, I didn't even get nervous! Maybe because I knew this was probably coming and should be done, but it didn't even hurt and was super quick. Last time I had blood work done I bawled my flippin' eyes out. Such a baby. A baby with four tattoos but still a wimp when it comes to needles or blood tests or IVs. Thanks for the update.......the braces aren't so bad; certainly beats the alternative. I'll continue to keep you in my thoughts and prayers (no neurologist)! Sending you a bunch of warm wishes, hope things help soon. Just thinkin' of you, Melissa & hoping you're feeling much better. I know carpal tunnel isn't one of those things that goes away quickly, but I have my fingers crossed for you & am sending you hugs.